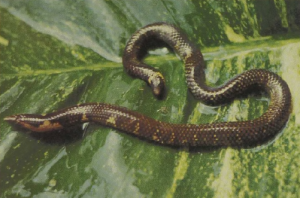 These shield-tailed snakes of the island of Sri Lanka (Ceylon) are borrowers with a sharply pointed nose bearing a keratinized ridge that allows them to penetrate more easily between stems and roots of moist soil. Each push extending their tunnel is followed by the formation of an S-curve in the neck, thus increasing the tunnel’s diameter. The mountain forests that were once their home have largely been destroyed, and most of the species of this group now survive in kitchen gardens amid the tea plantations and in other irrigated agricultural areas. Here these foot-long snakes feed on worms and insect larvae and give birth to live young. Like some other reptiles, the shield tails have become commensal, or dependent on man.